It was a cold, misty winter morning when the Swan steamboat was pulled off of the calm Sproat Lake waters for the last time. The Swan gets pulled out of Sproat Lake’s waters on Nov. 28. It was a cold, misty winter morning when the Swan steamboat was pulled off of the calm Sproat Lake waters for the last time by the Port Alberni Maritime Heritage Society. It’s been a hard life for the Swan—the steamboat spent decades working both on the ocean and at Sproat Lake before being sunk to the bottom of Klehkoot Arm in 1951. “It came to the lake in 1927,” said Art Skipsey, who rescued the Swan from the bottom of Klehkoot Arm. According to PAMHS president Kenn Whiteman, the Swan did some time in Alberni Valley salt water too. “The Swan took meat to Bamfield on a weekly basis, stopping at each of the docks along the way,” said Whiteman. But in the mid-1950s, its then-owners sunk the 60-year-old boat. “[They] filled the boat with rocks at the dock, pulled it out about 30 metres and then sunk it in about 15 metres of water,” said Whiteman. The boat was offered to Skipsey for his Scout group but with a couple of boats already, the troop didn’t need anymore, so it went to Al Greenleigh. The Swan’s last journey before its initial demise was one to transport hikers in 1954. It sat at the bottom of the lake for about 40 years before Skipsey got the idea to pull it up. It was around Labour Day in 1994 when Skipsey recruited divers Curt Smecher, George Monrufet, current Port Alberni city manager Ken Watson and son Joe Skipsey to pull it back up to the surface. “It took us three days of work to bring it up and we used about 10, 45-gallon drums on it,” Art Skipsey said. And that’s what it got as Skipsey and his friend John Super spent months working away on the boat. 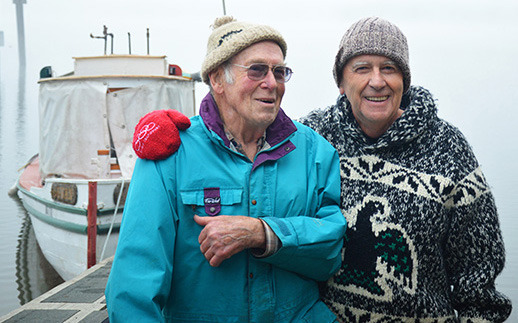 “He came and helped me­­—that was our entertainment for the time,” said Skipsey. They even built a cabin on the boat. But while it was floating, it wasn’t quite seaworthy just yet. “It took another year to get the boiler in,” Skipsey said. The engine came from rather far away. “The last time the engine was used was on the Hudson River in New York and it did a 500-mile trip up the Hudson River,” Skipsey said. It’s a powerful engine and it was a little more than what the Swan needed. “It’s a bigger engine than what the boat needs,” he said, adding that getting the boat in working order was a learning curve. But it was a labour of love for Skipsey, who poured countless hours and $40,000 into the job along with help from volunteers. The spruced up Swan is quite the boat—32 feet long and with a whistle heard around the lake. The Swan will be on display by the Ken Hutcheson Maritime Museum in the New Year. Correction: Klehkoot Arm was mistakenly called Faber Arm.